Angela Rowson and her dog. The mailboxes are on the old section of Riverside, connected by a driveway to the newly built curve. Here’s something I didn’t know until Friday: Postal delivery vehicles are not supposed to back up. And this was the reason given for why six households along a newly constructed segment of Riverside Drive didn’t get their mail delivered most of this week. Riverside has just been widened and repaved. The six houses are on a segment replaced by a new section that makes a wider turn around what had been a sharp curve. The west end of the old segment no longer connects to the road. The east end does, but only across an unpaved section of dirt or gravel. A new common driveway now connects the old segment to the new road. I read about the mail issue Friday in a Facebook post from Angela Rowson, whose house is one of the six on the old section in the 65000 block of Riverside. The bike took me there in the afternoon, and I got to talk with her and two of her neighbors. As I understand it, the contract delivery service carrier on that route drives a Chevy Suburban and told residents there wasn’t enough room on the old section for him to turn his rig around without backing up. And backing up is what postal delivery drivers are not supposed to do. 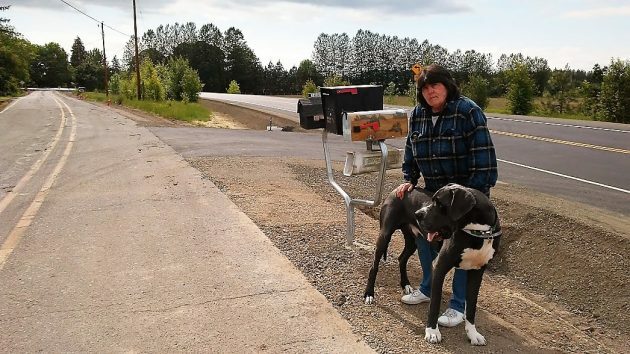 I understood from Rowson — with her service dog, a great Dane, by her side — that she had been trying to resolve the issue with the Albany Post Office by phone and was most unhappy with the response she and her neighbors had received so far. Just then her next-door neighbor, Ronald Thurber, drove into town to pick up his mail. I headed for the post office too, pedaling, and when I got there found Thurber talking at the counter with Postmaster Pamela Moody. By the time I barged in on their chat, they appeared to have settled on a solution. Yes, Moody confirmed, postal delivery drivers are not supposed to back up — unless there is absolutely no alternative like at the end of a narrow one-way lane. In this case, though, backing up might not be necessary. Thurber and the postmaster agreed that the delivery contractor could drive into the old segment via the unpaved east end, deliver the mail to the six boxes there (three of them together on a new post put up by the county), make a U-turn at the west end, then leave the old segment by the paved link to the new road and go on his way. Shouldn’t the county have taken care of moving the mailboxes to a new location directly adjacent to the new roadway? Seems to me that should have been done since it was the county that made the change. No, because that would force the residents to cross a wider road to get their mail. The present setup is much better for them as long as the mail gets delivered. A question would be…Will the County vacate the “old roadway” and allow the residents along it to purchase the land?? For now I’d just move the mail boxes out to the new section. So, when two parties work toward a goal, good things happen.